The first volume in this Early Childhood Education and Care in the 21st Century: International Teaching, Family and Policy Perspectives miniseries provides a snapshot of early childhood education and care from 19 different countries around the world. The intention is to provide a description for the policy and provision for young children and their families in each of the unique contemporary contexts. The selection of countries includes every continent in the world to provide variety across cultures, socio-economic status, location, population and other unique factors. 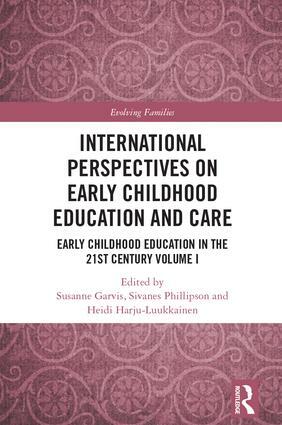 Some chapters also share the development and history of early childhood in their country, including economic and political transitions that lead to changes in early childhood provision and policy. The book provides essential takeaways for early childhood educators, researchers, early childhood organisations, policy makers and those interested to know more about early childhood education within an international perspective. Susanne Garvis is Professor of Child and Youth Studies at the University of Gothenburg, Sweden. She is the leader of the funded Nordic Early Childhood Research Group (NECA) and currently works on national and international research grants around early childhood education and care. Sivanes Phillipson is Professor of Education and Associate Dean International at the Faculty of Health, Arts and Design, Swinburne University of Technology. She is also the Routledge Series Editor for Evolving Families, and is currently working on a number of national and international grants on families and children education. Heidi Harju-Luukkainen is adjunct professor at the University of Helsinki (Finland), associate professor at the university of Gothenburg (Sweden) as well as a senior analyst at the University of California, Los Angeles (USA). She has conducted research around Europe, USA and Saudi Arabia in more than 20 different research projects. This series focuses on issues, challenges and empirical best practices surrounding evolving families that impact upon their survival, development and outcomes. The aim of this series is twofold: (1) to showcase the diversity of evolving families and the multiple factors that make up the function of families and their evolution across time, systems and cultures;　(2) to build on preventative, interventionist, engagement and recovery methods for the promotion of healthy and successful evolving families across generations, social and political contexts and cultures. Each book in this series will present a coherent view of at least one theme of the evolving families with the intention to articulate meaningful empirical research that informs best practice in sustaining evolving families and their future. Possible themes can be around (but not limited to) cultural and racial backgrounds, disabilities, social and economic disadvantage, stress, inter-generational mobility, grief, transitions, internal and external conflicts, and policies affecting families. The books will also derive its contents from dialogues between researchers and practitioners and inspire further intellectual debate amongst its readers. All books in the series will address relevant research and practice from around the world, and whilst the books will be allowed to have their own unique feature, each will provide a comprehensive and stimulating introduction to the evolving families of this millennia.